It’s on again! 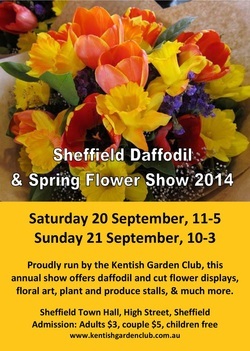 The annual Sheffield Daffodil and Spring Flower Show will be held at the Sheffield Town Hall on 20& 21 September 2014. You can tell winter is nearly over when spring bulbs make their appearance, and the annual Daffodil and Spring Flower Show opens its doors in Sheffield. Known as the oldest continuously running flower show in Tasmania and possibly Australia, the show appeals to people of all ages. This year’s show is no exception. From one of the best displays of daffodils and spring flowers on offer, to interactive displays, plant stalls and produce stalls, visitors will find something to interest or inspire them. Visitors will be able to enjoy the cut flower displays and floral art, as well as have the opportunity to talk to many of the hosts of the show – the Kentish Garden Club. Light lunches will be available, as well as morning and afternoon teas. To view or print out the Daffodil Show Catalog, please click here.